Once upon a time, this Balinese inspired tropical escape had many fatal flaws. 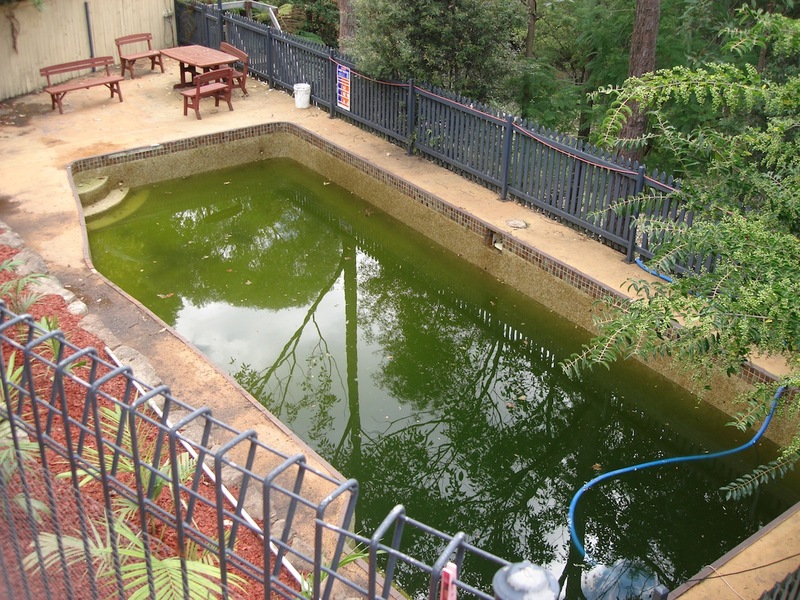 Although the home’s owners loved their leafy upper North Shore environment, enjoyment of their invariably frigid swimming pool was restricted to only the hottest summer days. Positioned to take in the natural bush views, in Sunset’s view the pool’s original developers omitted to adequately asses or compensate for the lack of direct sunlight on this 3.5 metre deep pool and its surrounding deck. Sunset Pool Renovations overcame this pool’s numerous shortcomings and delighted its owner’s who now enjoy many months in their warm and inviting Balinese style resort. The result also won Sunset multiple gold medals, including the National SPASA award for an outstanding swimming pool or spa renovation (over $20K) . Sometimes you can’t see a way to give new life to a pool that simply doesn’t work. 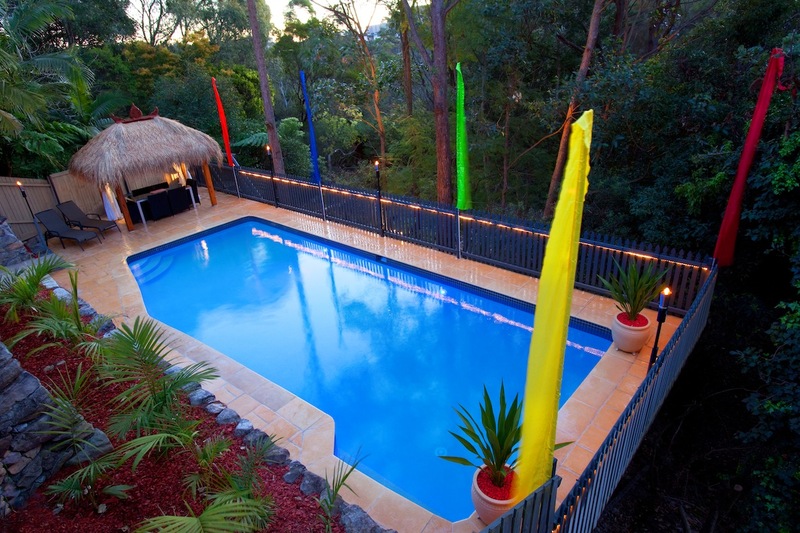 Call 1300 000 412 today to discover how Sunset Pool Renovations can cost effectively restore your redundant leisure assets. Alternatively, complete the online enquiry . 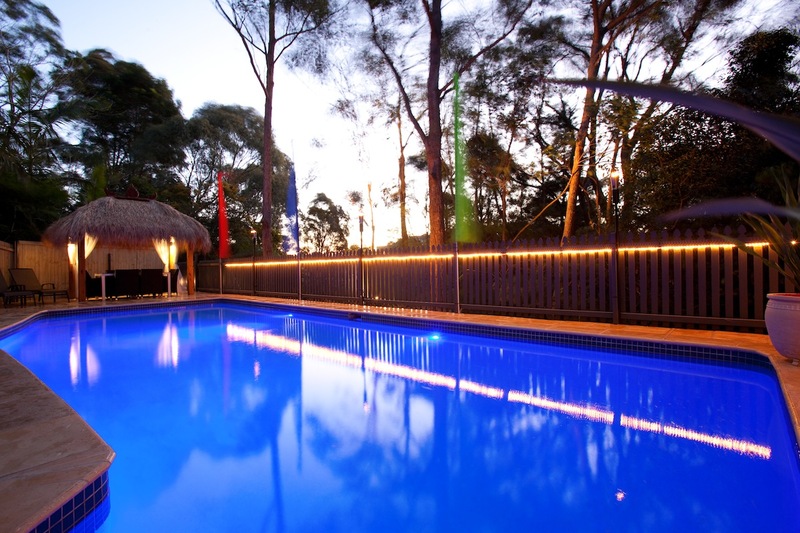 For this Sydney home owner, calling Ben Thompson at Sunset Pool Renovations turned out to be an award winning decision, and a prize that is now continuously enjoyed by friends and family throughout the extended swimming season. The lack of direct sunlight penetrating this pool’s very shady position meant that any natural water heating was practically negligible. 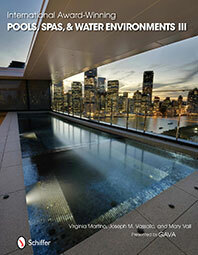 The pool shell’s partially out of ground structure created an additional and thermally inefficient aspect that effectively accelerated the loss of what little radiant warmth the pool accumulated. For a family who relish every opportunity to entertain outdoors, these deep and frigid waters within their leafy environment were a constant reminder of the tropical escape that was apparently never to be. Sunset’s design engineer are renowned for their capacity to cut through adversity and define practical solutions that overcome what are often perceived as unsurmountable technical and design issues. 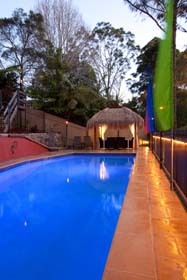 This Sydney pool renovation exemplifies another practical Sunset resolution. As there was no sunshine at the pool site and removing the adjacent reserve’s trees was not an option, Sunset went looking for their namesake. Following shadow plotting and reviewing the adjacent home’s aspect Sunset determined that an economical solar solution could be the most practical answer. On further evaluation and comparisons with electric and gas pool heating alternatives a solar approach was the recommended resolution even though the pool is situated almost 50 metres from the rooftop solar collectors. 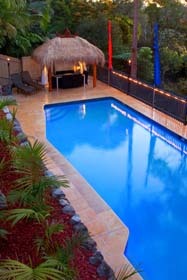 The pool’s 3.5 metre depth and resulting high water volume relative to its surface area together with the sunken pool’s remoteness from the adjacent home’s elevated position dictated a pool heating reticulation system separate from the pool’s renewed water management and sanitation installation. Applying ‘Sunset Standard’ 50mm hydraulics and top or the range Hurlcon equipment throughout ensured that sufficiently high water volumes passed through the rooftop solar array to significantly and quickly raise the pool temperature whenever conditions were right. Thermal lagging on 50mm return pipes and insulation of the pool’s exposed concrete shell reduced heat loss to maintain the pool’s temperature day and night. The extensive ‘Sunbather’ solar array installed to heighten the effectiveness of this new pool heating system is approximately twice the collection area usually applied. By doubling the size of the solar energy collector to 150% of the pool surface area optimum heating efficiency is achieved even when weather conditions are less than perfect. Sunset specified a HiPEC nitrile commercial grade PVC absorber because of its greater resistance to weather, chlorine and micro-organisms. The longevity of the UV stabilized luran headers and coloured matting (that can be matched to your home’s roof), is guaranteed with a 10 year full warranty, plus an additional 5 year pro-rata warranty on both the absorber and extrusions. The pool heating’s patented digital controller and inbuilt surge protection has aided the owner’s rediscovery and enjoyment of the swimming season, significantly increasing their ability to host wonderful outdoor entertainment. . This refurbished pool’s water temperature is at last warm enough to enjoy, plus the ultra efficient hydraulics and filtration keeps the water cleaner and more inviting than was ever achieved following the original installation. Sunset and their clients all appreciate that you do not win three gold medals for ‘a creative cover-up’. Thorough preparation, repairing faults, often deep within the concrete shell, and restoring surfaces are the fundamentals of every Sunset Pool Renovation’s finish. In this example the pools detractingly aged interior was blast cleaned in preparation for the application of Sunset’s new ‘Samoan Blue’ interior. The shell walls were core drilled to accommodate the upgraded 50mm hydraulic suction and return ports. Finally, the concrete surrounds were repainted before the landscaping and lighting were upgraded to complete the resort feel. 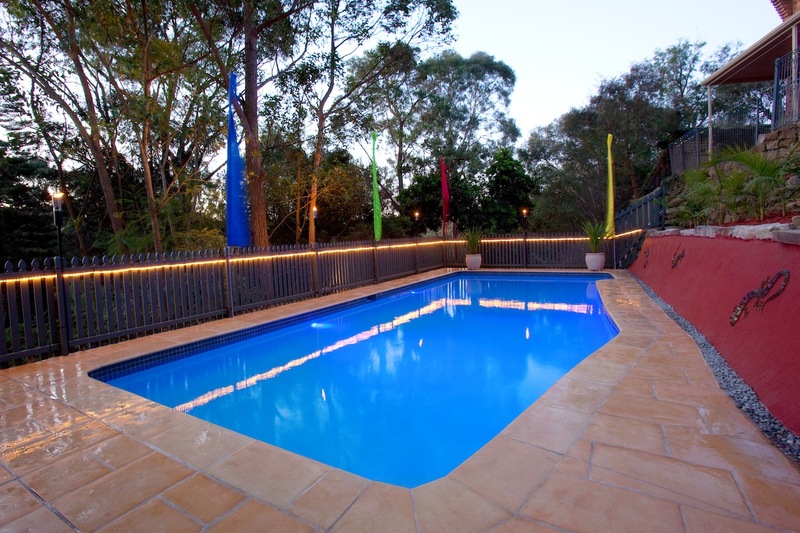 In addition to award winning domestic projects Sunset Pool Renovations provide specialised consulting and refurbishment services and insurance restorations to commercial and government clients. Sunset has a reputation synonymous with accurate estimating, sound administration, safe and environmentally responsible work practices and having all the required licences and insurance. 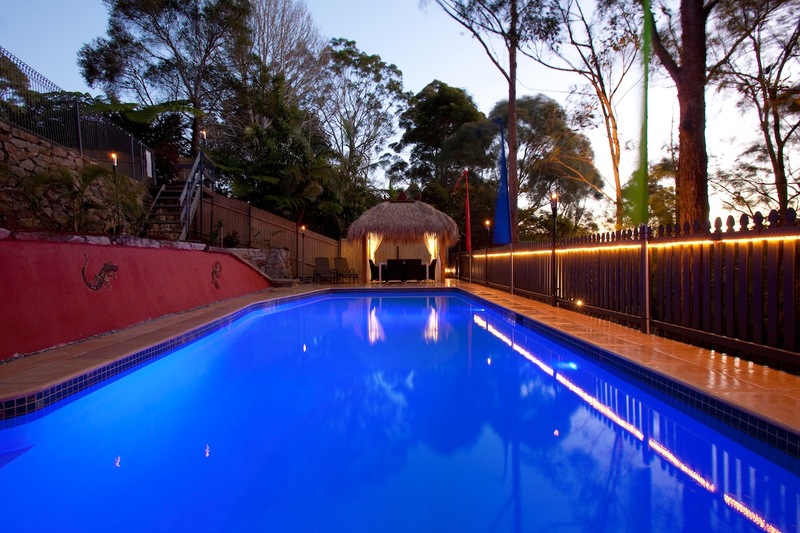 If your existing swimming pool has inherent faults, or is beginning to show its age, call Sunset Pool Renovations on 1300 000 412 or complete the enquiry form today . It’s time you discovered how Sunset could improve and update your pool or spa to better serve you and your environment for many more years to come.